So, I like a good cheesburger as much as the next guy, but this is going a bit too far. Bennigan’s, the restaurant chain that may or may not have “flair,” has come up with some new menu items centered around the cheeseburger. “Each has a unique and distinctive taste that fits in perfectly with our menu,” says Clay Dover, vp of marketing, in a release. “With cheeseburger salads, pitas and appetizers, there is something for everyone.” Not exactly sure who was clamoring for a Peppercorn Cheeseburger Ranch Salad or Cheeseburger Egg Rolls with Cheeseburger Dip, but it seems a little excessive, no? 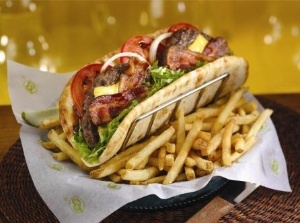 (The menu item/train wreck shown here is the BBQ Bacon Cheeseburger Pita.) Cheeseburger crossover products don’t have the best history, anyway. When Donald Trump’s apprenti made a cheesburger pizza, he thought it was “fabulous.” Still, I haven’t heard much about it since. Don’t think it’s a hot seller.